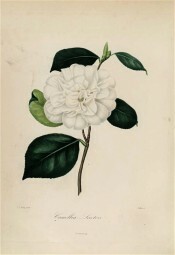 A cultivar of Camellia japonica L., ‘Nivalis’ has formal, double, medium large white flowers. [ICR, FC p.154/1836]. Synonyms include ‘Nivalis de Loddiges’ which suggests that it originated in this nursery or was first distributed by them. Berlèse, in his Monographie, lists and describes two varieties with pure white flowers, ‘Lacteola’, bred in Italy in 1830 and ‘Nivea’, bred in Belgium before 1837. [Berlèse Monography p.96/1838]. Although they are probably unrelated to ‘Nivalis’ which is an English cultivar, the latter probably resembles these two earlier plants. [Berlèse Iconographie vol 1 pl.45/1841-43]. Listed in the 1850 and 1857 catalogues [T.246/1850].